It’s win at all costs for Banbridge Town this weekend. They travel to take on basement side Wakehurst (kick-off 3pm) knowing defeat could see them drop back into the doomed bottom four. Wakehurst have lost nine of their 12 Championship Two matches so far and manager Paul Muir recently stepped down. “We won’t worry too much about that,” said Watson. “We will just concentrate on what we’re going to do and how we’re going to play. It’s a very important that we get points on the board before the Intermediate Cup match so that we can look forward to the next league game at home to Limavady. Town are without Glen Waddell and Chris McGrath while Stuart Thompson is doubtful with a hamstring injury. 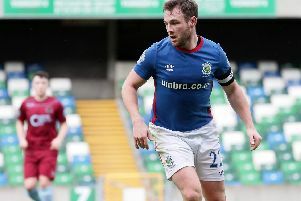 Stuart King and Matthew McCartan will come into the squad.